The grandfather of slasher movies is rebooted for the modern age in David Gordon Green’s Halloween. John Carpenter’s Halloween deserves the label of “classic” as far as I’m concerned. It’s a wonderfully tense and expertly crafted mood piece that shows just how talented John Carpenter is. It’s no surprise that it spawned a number of sequels and a couple of reboots that wildly vary in quality. This film is a reboot that ignores every film since the first one which might initially be confusing to fans of the series who have already had to get their head around two reboots before this point. All told it’s all fairly simple as in it’s still a film about a big guy in an inside out William Shatner mask killing people in increasingly brutal and creative ways. As plots go it’s designed to be easy to follow and any attempts at story are more or less window dressing that kills time until the gore kicks in. For the 2018 version of Halloween a decision was made to strip everything back to basics and remove all of the complications that have been added since the original to make it a simple story about a serial killer terrorising a small town and it’s occupants. There’s a neatness to removing everything and starting fairly fresh though the reverence people have for the franchise manages to be a small yet effective part of the story. 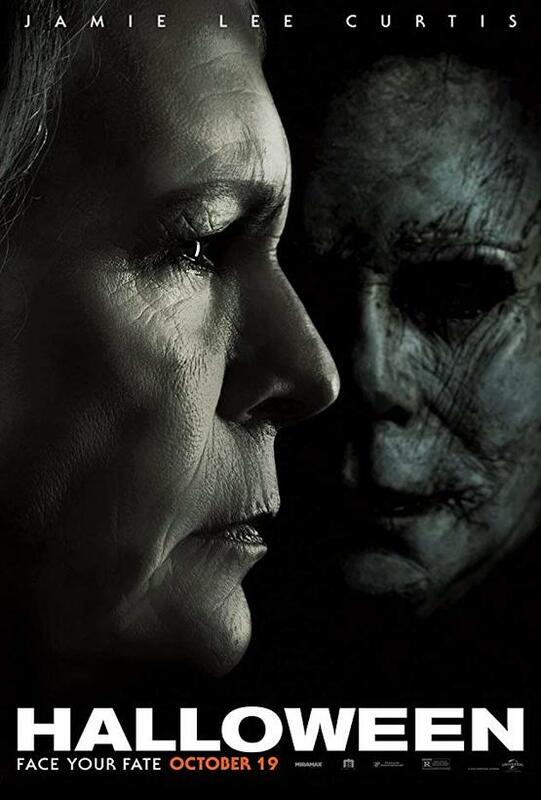 The story is that Michael Myers has been locked in an asylum for 40 years following the events of the first film and Laurie Strode (Jamie Lee Curtis) has been preparing for his escape since that fateful night by becoming proficient in weapons, training her family and preparing various traps so that she can be the one to kill him. It’s an interesting idea as it makes a lot of sense that Laurie Strode would be so traumatised by her experience that it would come to define her. There’s a real sense that there won’t be any closure for her until she sees Michael Myers dead preferably by her own hand. In many ways Laurie’s story is that of a inspirational survivor as she chose not to cower away from her demons though her obsession with facing them is less than healthy. There are other details that make up the narrative such as having a poor relationship with her daughter, Karen (Judy Greer) because of her obsession and a distanced relationship with her granddaughter, Allyson (Andy Matichak) because of the lack of connection with Karen. Basically it’s a surface level story about how life altering trauma affects three generations of women in the same family and it’s really interesting to contemplate. Unfortunately it is all very surface level and not much is done with it beyond periodically refer to it before it’s resolved by the end to some degree. Jamie Lee Curtis is excellent here. It’s a very different Laurie Strode to the original and there’s a lot of nuance to her performance helping to show how haunted Laurie is by what she experienced. Judy Greer is fine in her role but doesn’t have a lot to do for the most part and Andy Matichak definitely stands out with her engaging performance but fades into the background more often than she should thanks to the writing. The main problem with Halloween (2018) is that it feels like there are three stories vying for attention with none of them really defining the film in any way. Part of it’s a revenge story as far as Laurie Strode is concerned which combines with her desiring a relationship with her family, another part of it deals with the psychology of a serial killer and how that impacts others as explored through Dr. Sartain (Haluk Bilginer) and lastly there’s the story of teenagers being picked off by Michael Myers as they attempt cut loose on Halloween night. All three of those stories have merit on their own but suffer from a lack of attention when fighting for screen time with the other two. I get the impression that all of these ideas were being thrown around and a decision was made to combine them at some point. All told it doesn’t really matter as this is a fairly simple slasher film when all is said and done. As I said the story only really exists to fill the time between kills and none of it ever stands out as being glaringly boring. The film delivers exactly what it promises and does it really well. Very few of the characters are strong enough to actually invest in though some are insufferable enough to make it satisfying when they are killed. This applies mostly to the teenage characters who are written like adults trying to approximate teenage behaviour. Allyson comes off the best in all this as she actually has some agency within the plot and seems to understand the most likely action to secure her survival. The kills themselves are competently executed but vary in overall quality. A lot of the time they cross the line into being more amusing than terrifying though there are moments dripping in tension such as a sequence involving Laurie Strode hunting for Michael Myers. The physicality of Michael Myers is always used well and his relentless nature helps create some of that tension with carefully considered direction doing the rest. It’s definitely the best of the Halloween sequels or reboots. A worthy sequel to the original Halloween that strips away all of the overly complicated elements to deliver a simplified take on the iconic franchise. The idea of Laurie Strode living with the trauma of that fateful night for 40 years and looking to kill Michael Myers so that she can gain some form of closure is a strong one. Having that affect her familial relationships is a nice touch as well though it struggles to compete with the other two underdeveloped stories vying for attention. The kills themselves are competently executed though sometimes come across as more comical than terrifying. There are some standout tense moments thanks to carefully considered direction. This is definitely the best of the Halloween sequels or reboots.